Cheers to a Gorgeous Life! : Holy Kettle Corn is ya-ya-yummy! 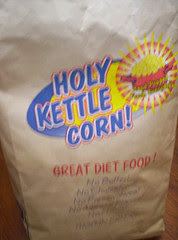 I am addicted to Holy Kettle Corn since I tried it last Friday. I've been eating a bag per night for straight 3 nights now, munching while watching another Kimura Takuya's dorama... ohhh the good life! You can find Holy Kettle Corn (HKC) stalls everywhere. There's one in Glorietta, SM megamall and at the Petron station near our office (along the Buendia-Makati Ave. intersection). The medium size bag costs 25php and the large one costs 60php - not bad eh. It's healthy also because it doesn't have butter or the usual cheeze/barbecue flavoring. It just contains sugar that is sweet and salt that is not sweet (duh!)... Okay, it's not that healthy, but definitely a better option than a regular junkfood. There's also Kettle Korn. There's a stall in SM Makati and also sold in convenience stores like Mini Stop. I don't like it because it contains more sugar than HKC. One time I found lumps of sugar at the bottom of a bag. It's just an HKC wannabee.